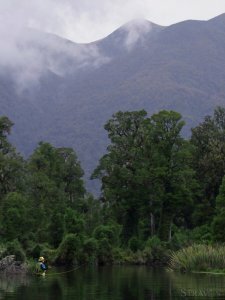 New Zealand holds some of the last examples of true wilderness fishing in an environment unspoiled by man. Fish the crystal clear spring creeks for those heavy fish that await you, or high country lakes, free stone streams and the glacier fed mountain rivers that are home to some of New Zealand's largest trout and salmon. We offer Fly Fishing - casting tuition/lessons, guided fly fishing, spin fishing-thread lining, lake trolling and specialise in jet boat fishing safaris and helicopter fishing. Spend a day or enjoy multi day safaris covering different waters of the South Island, each day a slice of heaven with the ever changing landscape and high-octane fishing!